Hello. I'm Herbert Ho, Owner of Mathnasium of Ajax, your neighbourhood math-only learning centre. We help kids in grades Gr 1 - 12 understand math by teaching the way that makes sense to them. We are located at the SE corner of Rossland and Harwood facing the Tim Hortons next to Longo's. Come and visit us for a FREE Trial and see how we can help your child become CRAZY about math! Making math fun is not an easy task. My daughter enjoys her time at Mathnasium. She’s learning and having fun at the same time. This is our second month at Mathnasium and so far so good. Thanks Mathnasium Ajax!! Mathnasium has been a great help to my daughter! I can see her improvement in her math and her confidence! All the Mathnasium staff is kind, patient and very knowledgeable. My daughter is always happy to go there! I would definitely recommend it!! It was a great learning experience. The atmosphere is great and the instructors are all knowledgeable, always ready to help and super kind. The hours are very flexible, allowing students to schedule according to their preferred time . I would definitely recommend! The chief administrator of the institute is very friendly and very accommodating. -Mariam. I am impressed with my son's developing confidence with mathematics. I have also observed that this confidence is having a positive impact on his other courses and extracurricular activities. 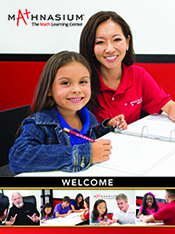 The center promotes personalized coaching based on the child’s need. My son is so excited to go to Mathnasium. It’s brought back his enjoyment of math. So convenient, between 3 to 7,I can go any time. Open on Saturday. Instructors r really helpful.